Part 1. OPTO-MECHANICAL SURVEYING INSTRUMENTS. 1. Fundamentals and elements of optics; Levels. 2. Instruments for measuring angles. 3. Instruments for measuring elevation. 4. Precision instruments for horizontal and vertical setting out. 5. Instruments and equipment for distance measurement. 6. Instruments for tacheometry. Part 11. ELECTRONIC SURVEYING INSTRUMENTS. 7. Elements of electronic instruments. 8. Distance measuring instruments using the principle of interference. 9. Electronic distance measuring instruments. 10. Electronic theodolites and tacheometers. Part 111. OFFICE INSTRUMENTS AND EQUIPMENT FOR PROCESSING. 11. Grid square and coordinate plotting devices. 12. Equipment for automatic mapping and plotting. 13. Automatic equipment for map production. 14. Instruments to measure areas. Appendix. Selected bibliography. 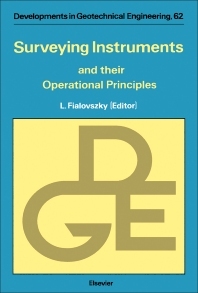 The book gives a detailed theoretical background of the constructional principles of instruments necessary for the most general tasks of surveying. Undergraduate and graduate students will find it very useful in surveying studies to get acquainted with the broad variety of instruments, both classical and new ones. At the same time, specialists in surveying will also find the book full of new material. The book contains about 600 pictures, including photographs and detailed descriptions of the most representative types of instrumentation. Older types of instruments already out of use, or used only occasionally, are described in broad outline, mentioning basic principles, methods of testing and possibilities for their modernization. New categories of instruments, such as gyroscopes, compensation levelling instruments, electronic theodolites, distance meters and tacheometers, are dealt with in more detail. Care has been taken to include the automation which is rapidly spreading in all fields of instrument manufacture, being necessary to reduce manual operations. The book is intended for builders, architects, technicians, teachers of surveying and professional manufacturers.